A few years ago my husband Tim inherited a gorgeous old desk from his grandfather. His name was Harry and so harrysdesk was born. It’s located in the middle of family life and somehow I’ve ‘inherited’ it from Tim (I didn’t have to kill him for it). It’s the place I do a lot of things – think, create, design, research, blog, pray, communicate with friends – and it’s the name I design under. I feel enormously blessed by the life God has called me to live and it’s exciting to be able to share a some of it. 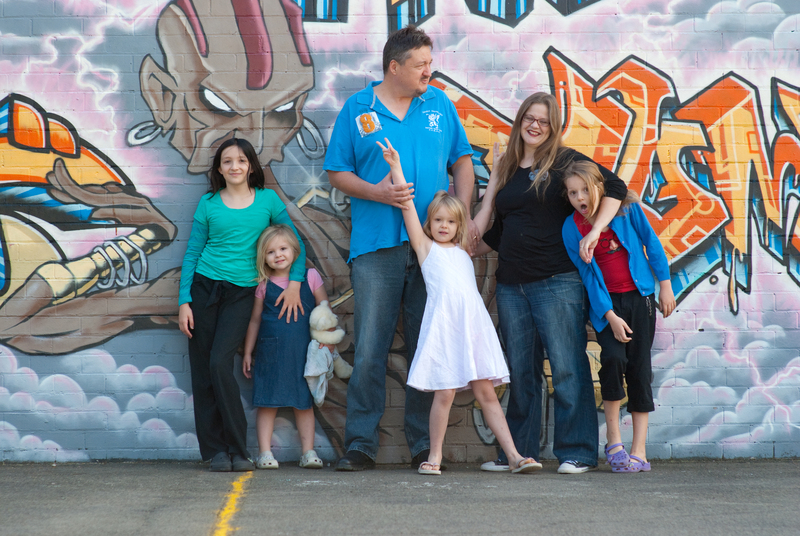 Most of my time is spent raising four fantastic girls (6,9,12,14) with Tim. It’s crazy and great. Yay Ally!! I am so excited! I have added your blog to my blog creative list. I am intrigued about this famous person you made a bag for… hmmm. Look forward to seeing more and more of your designs and watching you grow in your own creative universe… CRAFT ON!!! Alice, your bag is done and being prepared for posting. Hey lovely! Nice of you to drop by. Love the picture at the top of your blog!!! And quite fond of the name too!! Thanks Ingrid for dropping by. My lovely friend Christen took it, talented girl that she is. She also took the one above of our family, and lots of others all over the blog. Go check out her website, if you get a chance. Unfortunately for me, she has relocated to Canada for a while. Boo Hoo. We have been spared, so far, hormone horrors, but keep praying those prayers for my equipping. I need it.